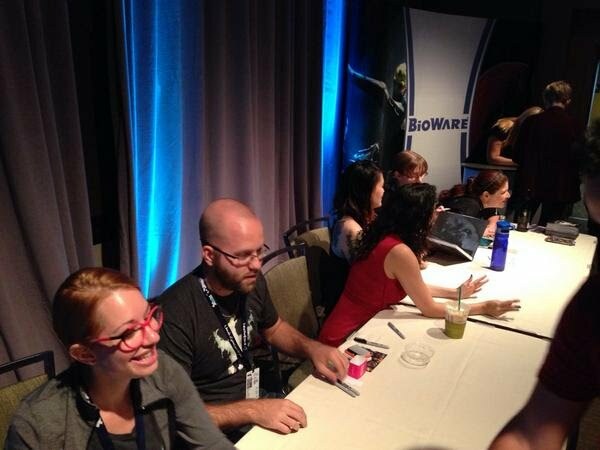 Dragon Age Facebook page with pictures from PAX. More panels today - see the schedule. News here as it comes in. I will announce when I have more codes so it's a fair shot at access for most involved. Sorry about time zone shenanigans. Note: I will not have codes until at earliest this afternoon, about 5-6 hours from now. So don't hold up your life for that! Guys I took 5 more codes. I am getting to a safe place to communicate them out. ETA 15 minutes. We are giving away one last batch of @DragonAgeKeep codes from #PAX! Follow us and RT - #KEEPME for a shot. Winners chosen later today. GL! One of the books in #DragonAge Inquisition - "Before Andrastianism: Forgotten Faiths"
If you're wondering why I haven't made the panel breakdown yet, it's because there's more info every day. I'm compiling everything tonight. Was there ever plans for a live action movie for #DragonAge? Chris Bain: "Yep." but nothing to share on any plans right now. I can also do a giveaway for people who can't type fast enough! I'll put aside 3 for now. Favorite this tweet for a chance! I'll pick later. Lady Insanity will be posting Keep beta codes (first one around 10am Pacific time), Allegra Clark (VA of Josephine) will be posting them randomly on the BSN, Nerd Appropriate will be giving some away if you follow/retweet, and we'll probably have other devs post them all day like yesterday. Keep your eyes peeled! There are many panels today - check out the schedule for details. There will be signings today at 5pm (Pacific) and tomorrow at 2pm, also with Allegra Clark. News will be here as it comes in! Impressions on Inquisition HQ and the Single Player Demo from forum member Fiery Phoenix. [regarding specializations] Quest to get the person who will teach you. Then you learn from them. [regarding the MP characters] I know that they have banter with other characters based on backgrounds (reaver won't get along w templar) so might be there. MORRIGAN FIGURE! I got a pic. One sec. Potato phone. Haven't had the chance to try out #DAI Multiplayer yet? Come by the Xbox booth from 1:30-6:00 pm tomorrow! Today's @dragonage demo fun! @aidanscanlan sports Cole's iconic hat. Cori & @KarinWeekes loot elfroot on the floor. I have a question regarding #DAI... When will we have the PC requierements to run the game on PC ? Devs are tweeting pictures with Keep Beta codes in them. So far they've come from @DiscoBabaloo, @LesPaulDuJour and @iAmSparkkie - keep an eye on the Twitter Roundup page (it auto-refreshes) or for even faster updates go straight to the dev list on twitter. Also - don't forget in addition to the tons of panels today, there is a cosplay parade from 1-3 PDT. 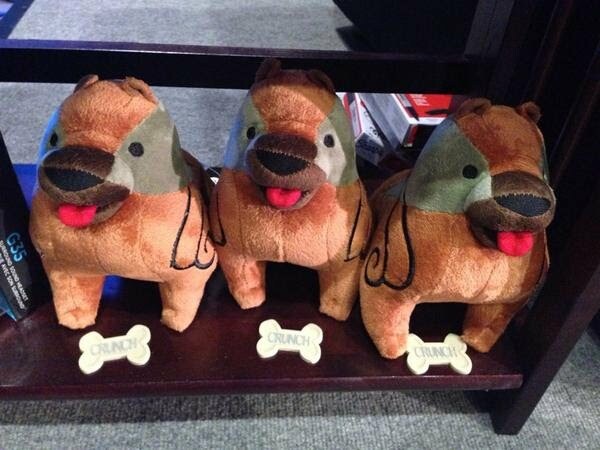 Everyone wins a limited edition Mabari plushie! 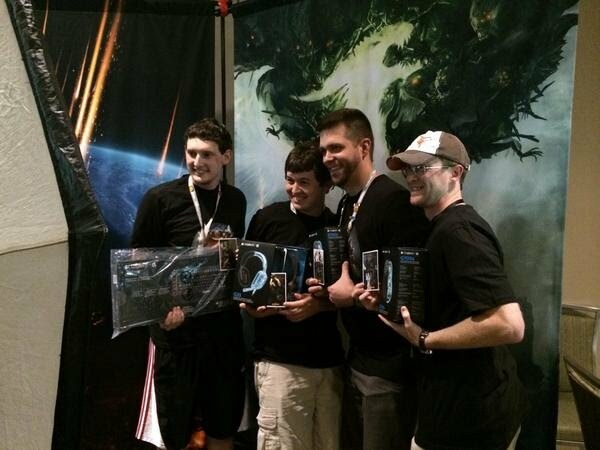 If you're at #PAXPrime come to the #BioWareBase for free shirts & beta keys! Chris Bain on Last Flight by Liane Merciel: While mixed success with external authors, this one "phenomenal" and magic's written so well. "There is an event that will open up all of the world" for exploration. Whether the peace talks exploding or a different event, don't know. "Whole world" as in all the locations available in Inquisition, you guys...it's still Ferelden and Orlais. The little buttons in the bottom right do the same thing, because everything should be accessible by the mouse. (Press the map icon, map shows up). You can also press the ESC key (or press the button on the hud) and get the list menu that Allan was referring to, which has your Journal, Map, Character Record, save, load, etc. (Click on the map in the list, map shows up). The ground rings have a few settings, you can always show, always hide them or have them just during tac cam. Hope that answers a few questions, there is more PC specific stuff on the way. The very first team to complete the #DAMP challenge!! Congrats!! There is no streaming at PAX this year, so we're going to have to prowl through twitter, tumblr, youtube, and the forums for tidbits. Multiplayer, single player, and the Keep are all getting previews and/or reveals at PAX, so stay tuned here for details as they come in. PC question 1: 8 Ability slots? A: Yes, per character. Changeable between combat. PC Question 2: What is that TAB thing? A2: Highlight stuff in the world. PC Question 3: Why 8? A: 32 abilities (along with passives/upgrades) across the party provides a broad spectrum of tactical options. Ability count clarity: DAI is about roles, planning ahead and making tactical decisions. Potions, ability choice, gear, party composition. I recognize that not everyone will be happy with the change, but better to let you know about it now than a surprise later. You can map 8 active abilities per character in your party, and their passives always apply. If you swim too deep in #DragonAge, you will take damage. And probably die. 1.89x10^21 valid permutations for Keep. Better chances to win lottery than have same world state as someone else. Or something like that. 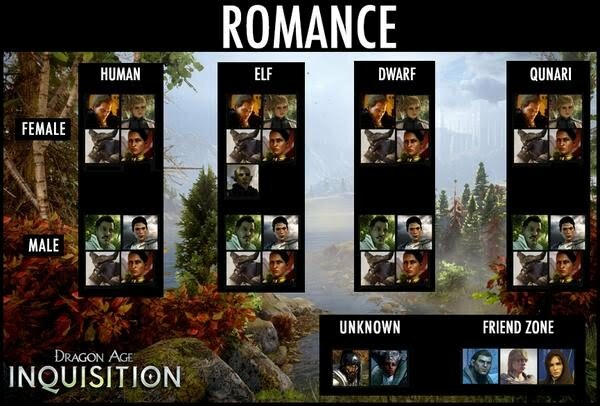 On available #DragonAge multiplayer characters (at launch): 1 Qunari, 1 Dwarf. A few Elves. Mainly humans. More characters post-launch. 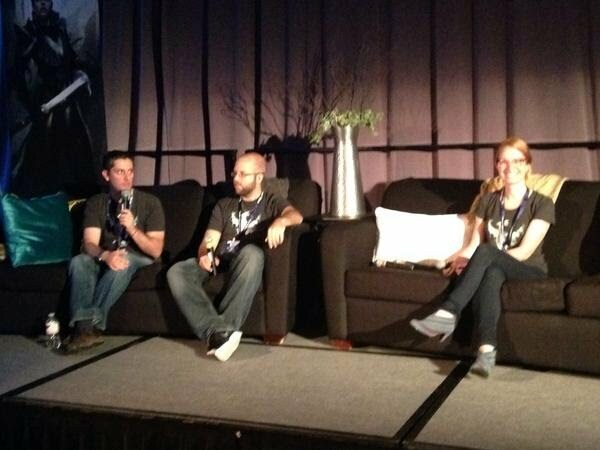 Q&A @DragonAgeKeep: If your memory is fuzzy, Keep provides context for decisions you make! You may also learn about choices you didn't make! Q&A @DragonAgeKeep: Using HTML 5, Keep is easy to use on all devices including the web functionality within consoles! Inquisition HQ, an app to set your characters up for multiplayer, is coming up in the next panel. My last panel of the day! 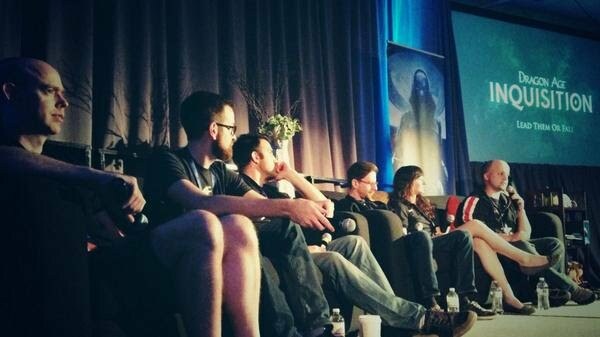 The Keep will apparently be narrated by Brian Bloom (Varric) - this was in a tweet from a PAX-goer that was favorited by one of the devs. Response to the Keep reveal has been very positive! Go team! My sincere thanks to @ladyinsanity @AbilityDrain @gamermd83 @ScottishW92 for helping us get all of you @DragonAgeKeep reveal info!